Details of Elliot's death emerges, relatives speak out: "He has caused us so much trouble"
While he got the world in hysteria and shock for the past weeks for being resurrected and dying again, all that Thabiso Proud Mlanje who is popularly known as "Brighton Elliot Moyo" has left are deep wounds among his family back in Zimbabwe that they do not know when and how they will be healed. Thabiso who was 28 years old at the time of his death shocked his family because soon after they buried him at his late father's homestead in Dandanda Village in Lupane under Chief Mabhikwa they were summoned by the police who revealed to them that he was wanted for fraud in connection with his "resurrection" back in South Africa. "We didn't know that he had died and resurrected. Trouble started after the funeral because the police arraigned us and told us that he had been wanted for fraud," said Thabiso's father-in-law, Bernard Mayendayenda Sibanda. A grief-stricken Bernard said his son-in-law had caused him so much trouble. Pictured above: Elliot in Hospital Bed. "I am still in great distress because of what my son-in law did. I have had to deal with the police concerning his whole resurrection scheme and now since he is dead I have to answer questions I don't know. It causes me pain because I didn't know anything about what happened in South Africa. This man has put me and my family in so much trouble". 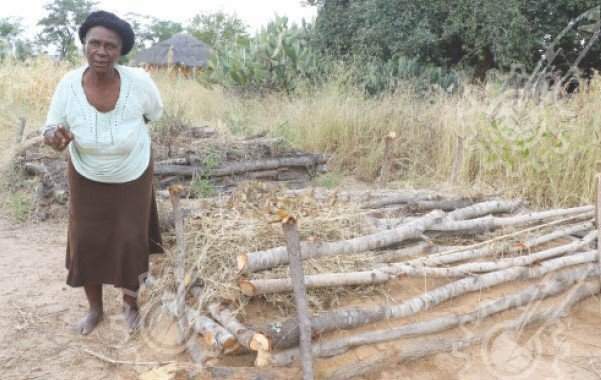 Thabiso's grandmother Emily Moyo said it hurt her to see her grandson arriving home in a coffin after spending seven years without communicating with her. "I raised my grandson single handedly because both his parents died in Harare when he was young. I only managed to send him to Gegeme Primary School but he could not go further with his studies because of financial constraints. That is how he decided to go to South Africa to make a living. Now what pains me is that it's been seven years since he went to South Africa and he had never set foot home or contacted me in those seven years. I only got to see him as a corpse. We buried him right next to his grandfather because when he was sick he kept telling his in-laws that he wants to lie next to his grandfather. "At the time of his death he was constantly vomiting blood, it was such a painful death. I wish someone could properly explain to me what was happening in South Africa because I hear he was once dead for three days and was resurrected by a pastor," said Moyo. 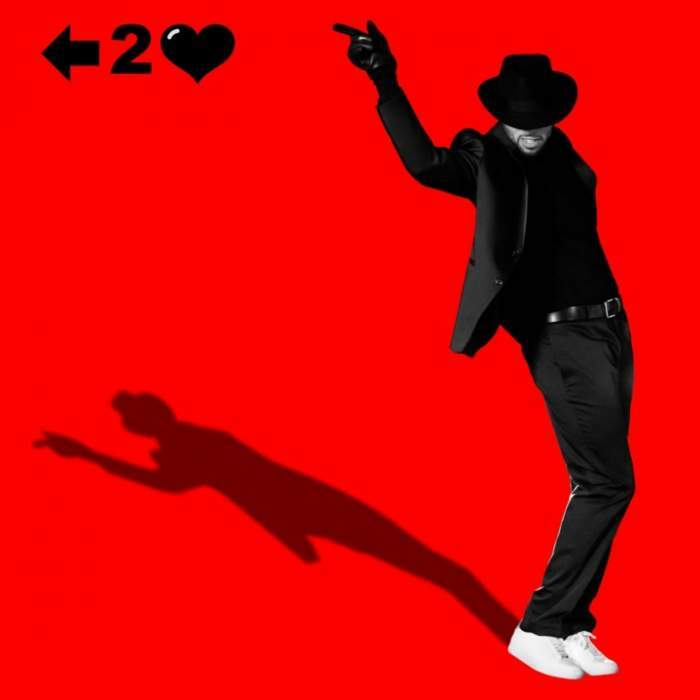 It is reported that all this drama is believed to have started sometime in February when Thabiso fell ill. Even after he was resurrected he did not properly recover. To make things worse soon after the resurrection miracle Thabiso and Pastor AlphLukau had a fraud case CR 506/ 02 /19 opened at Jeppes police station in South Africa. The two were jointly accused of performing a fake miracle. Thabiso was scared of the police case so whenever his wife Simelweyinkosi Sibanda took him to the hospital he would sneak out. But his health kept on deteriorating so Simelweyinkosi then decided to bring him back home in Zimbabwe on 8 March. The couple stayed at Bernard's homestead in Village 2 Insuza under Chief Mtshane. As each day passed Thabiso's health kept on worsening so the family took him to the Mbembesi Clinic in Insuza on 23 March. On 1 April he was transferred to St Luke's Hospital in Lupane. Unfortunately he died on 3 April and was buried on 5 April. When asked about the resurrection miracle Simelweyinkosi vehemently denied being at her husband's resurrection though she is identical to a woman who is clad in a light pink dress, with short hair and shivering next to Thabiso when he is eating his food soon after the resurrection in one video clip. "I don't know anything about the resurrection thing because I was not there so I cannot comment on anything, the best person to talk would be his brother," said Simelweyinkosi. 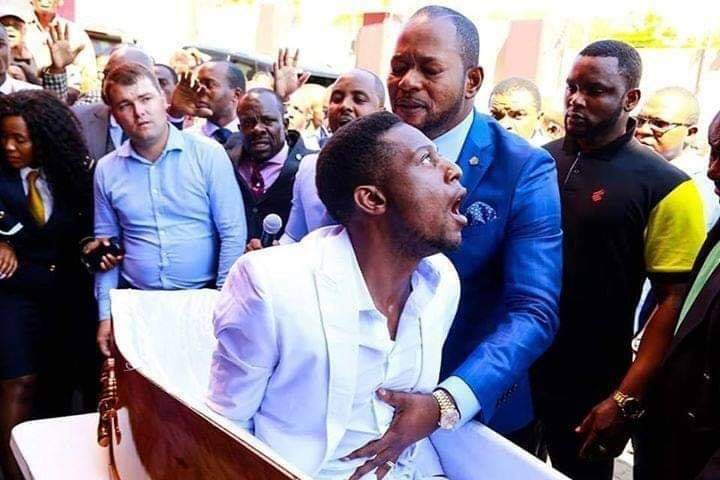 However, Stanley Mlanje, Thabiso's brother who permanently resides in South Africa but has been in Insuza for the past few days following the death of Thabiso did not waste time in confirming his brother was the one who is famously known as "Elliot" when B-Metro showed him a trending picture of Thabiso being resurrected by Pastor Alph Lukau. "Yes, this is my brother, I am looking at him," grinned Stanley. He added: "However, I cannot explain much on details surrounding his resurrection because I was not there. I also saw him trending on social media. About the fraud issue I cannot say much because the fact that he is my brother does not mean I would know everything about his dealings since he was an independent individual. I had so many questions to ask him about that whole resurrection thing but I couldn't because when I talked to him he was not so well so I thought I would ask him when he gets better. Just like everyone else, I still have questions for him but the most painful thing for me is that I will never get answers since he is dead," said Stanley. Stanley added that since there were only two children in his family so he is the one who has to take care Thabiso's children. "Thabiso left behind two children who are equally my children so I have to look after them, that is why I am here at my in-laws' so that we can plan on how best to keep the kids," said Stanley. The late Thabiso Proud Mlanje, aka Elliot Moyo' s grandmother Emily Moyo, says she is devastated by the death of her grandson whom she saw arriving home in a coffin after seven years without a word from him. "I raised my grandson single-handedly after his parents both died in Harare when he was still young. I only managed to send him to school up to Grade Seven at Gegeme Primary School. He couldn't go further with his studies because of financial constraints. That is when he decided to go to South Africa to make a living," said Moyo. She said what pained her most was that for the past seven years, Thabiso has been in South Africa he never communicated with her. "What greatly pains me is that it's been seven years since he went to South Africa and he never returned home or contacted me in those seven years. "I only got to see him as a corpse. We buried him right next to his grandfather because when he was sick he kept telling his in-laws that he wants to lie next to his grandfather," she said with tears down her cheeks. She added: "At the time of his death I was told he was constantly vomiting blood; it was such a painful death. I wish someone could properly explain to me what was happening in South Africa because I heard he was once died and was resurrected by a pastor." Villagers in Dandanda also expressed shock on how Thabiso's dead body arrived in the village. "We were so shocked to see a speeding car with a coffin in broad daylight when the sun was so hot. In our village it's not allowed to transport a dead body in the afternoon. "So we were just perplexed and wondered what could these people be hiding," said a granny who identified herself as MaNdlovu. A number of villagers said they were also unaware that Thabiso became an overnight "celebrity" after the "resurrection" stunt. "It was shocking when we heard during his funeral wake that Thabiso once died and resurrected in South Africa and that the world knew about it except for us. I guess we never heard of the resurrection due to the fact that network is poor this side so we rarely communicate. "The other thing that also shocked us that the car carrying the coffin had only three people inside and it was speeding as if they didn't want fellow villagers to find out more about the dead person," said one villager who spoke on condition of anonymity.